Here’s a quick video I make to show someone how to model a helical slot that joins two other slots. Take the patient’s weight, height, blood pressure and temperature. Listen to him describe his symptoms. Inform him that he probably has a virus and should go home and get lots of rest and drink lots of fluids. The patient returns because he is still sick. Concede that it must be a bacterial infection and send him away with a prescription for antibiotics. The patient is still not better. Refer him to a specialist. A fake general practitioner refers a patient to you, a fake specialist. Order an exhaustive battery of tests. Schedule them as far in the future as possible. Do not call the patient when the test results arrive. Wait for him to call you. Then, decline to discuss them over the phone and schedule an appointment, again as far in the future as possible. At this point, the patient is either dead or feeling better, so you’re done! What is a Logic Level Power MOSFET ? Power MOSFET transistors are voltage controlled switches. They begin to turn on at their rated “gate threshold voltage” or Vgs(th). Most of the datasheet ratings are given for a fully saturated condition, typically 10 volts. There is also a maximum allowable gate voltage, Vgs, that is typically 20 volts. Any voltage greater than that will pierce the thin metal oxide layer that insulates the gate from the rest of the silicon die, destroying the device. This is why uninstalled MOSFETS can be so sensitive to electrostatic discharge (ESD) damage. The democrats and President Obama say they want a balanced approach to the Federal Budget crisis. While many of the PIC microcontroller models have at least one hardware PWM output channel that could be used to control an h-bridge, we’ll take a quick look at several models that are particularly well suited for servo and stepper motor control applications. 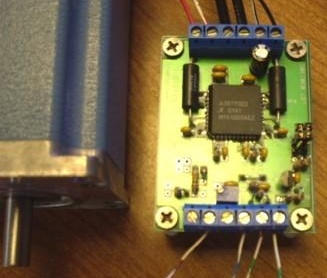 With dual h-bridges and a built-in translator, DAC and chopper circuits, the A3977 is a nearly complete microstepping stepper motor controller on a single chip. With the addition of a handful of external passive components, this IC is ready to accept step & direction signals from a pulse generator, microcontroller, indexer or CNC controller. Each pulse applied to the Step input rotates the motor one microstep forward or reverse, depending on the state of the Direction input. Thanks to its voltage and current capability, the LMD18245 is suitable for driving small PMDC servo motors or a medium size stepper motor winding. It incorporates a unique lossless current sense output. This chip also includes a 4-bit linear DAC to generate a reference voltage for the internal chopper circuit. When used in pairs, these chips can run a stepper motor at up to 8 microsteps per full step with reasonable accuracy. The LMD18200 is a similar IC that lacks the DAC and chopper circuit. Thanks to its voltage and current capability, the LMD18200 is suitable for driving small PMDC sevo motors or a medium size stepper motor winding. It incorporates a unique lossless current sense output that can be used by an external circuit for chopper current control. The LMD18245 is a very similar part that adds a 4-bit linear DAC and built-in chopper circuit. The TLE6209R has in interesting combination of parallel inputs for direct control of the h-bridge with a serial SPI interface for the internal settings such as current limit and chopper off time. Along with shout circuit protection, the chip has a selectable current limit. This might be used to limit motor current during startup, providing something like a soft-start function.